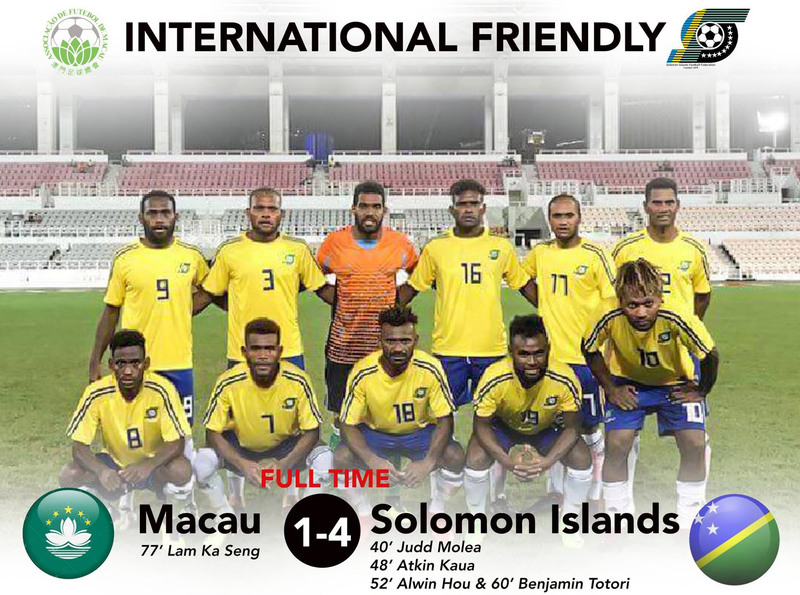 The Solomon Islands national team have beaten Macau 4-1 following an impressive display in the first of two international friendly matches for the Bonitos in the current FIFA window. In wet conditions at Macau Olympic Stadium, the opening goal for the Solomon Islands came from a set-piece in which a corner was neatly delivered at the back post where a waiting Judd Molea headed home in the 40th minute. Molea’s goal brought an otherwise uneventful first half to a close with the visitors taking a one goal lead into the second half. The Solomon Islands didn’t have to wait too long to add to their tally with the second coming courtesy of Atkin Kaua just two minutes after the restart. A short time later and Alwin Hou was netting a third for Solomon Islands before veteran striker Benji Totori pounced in the 60th minute to make it 4-0. Macau hit back in the 77th minute with Lam Ka Seng finding the back of the net for the home side but it proved too little, too late, as the visiting side finished with the win.